The New Hampshire Secretary of State provides an online tool that allows you to search for a registered business entity in New Hampshire. To search for an entity, you will need to know the corporate or the business entity name. Below is a step by step guidelines on how to use the NH business search page. 1. The first step is to access the New Hampshire business search page by clicking here. The search page looks similar to the screenshot below. 2. The business search form allows you to search by "Business Name", "Business ID" or "Filing Number". You can widen or narrow your search by selecting one of the search options "Starts With", "Exact Match" or "Contains". For this example go ahead and choose "Starts With". We will be searching by "Business Name", so select this option. In the text field type in the name "Presstek". Once you have done this, click the "Search" button as shown in the screenshot below. 3. Once you click the "Search" button, the results page will show a list of entities carrying the name given. You can see this in the screenshot shown below. 4. Click on an entity name to view further details about the same. The screenshot is shown below. The Secretary of State of New Hampshire is a constitutional office in the US state, New Hampshire. The office serves as the exclusive head of the New Hampshire Department of State. The present Secretary of State of New Hampshire is William M. Gardener. The New Hampshire Secretary of State is elected biannually by the ballot of all members of the New Hampshire General Court. The Secretary of State of New Hampshire serves the duty of both legislative and executive branch of the state. 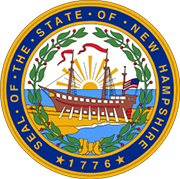 The New Hampshire Secretary of State is the custodian of the Great Seal of the State of New Hampshire and is the keeper of the state archives and the public documents. The New Hampshire Secretary of State is also in charge of distributing all election related items following the election code of the state.